Monitoring the business performance and tracking relevant insights in today’s digital age has empowered managers and c-level executives to obtain an invaluable volume of data that increases productivity and decreases costs. In fact, data has become the raw material that every business decision is based on while reporting tools create the environment to act on generated information swiftly and accurately. Tracking the success metrics based on your needs, and the time frame you select while comparing your values can be done with simple yet effective scorecards. In this post, we will explain what is a KPI scorecard, when to use it, what is the difference between scorecard and dashboard, and KPI scorecard examples and templates from business scenarios that can be applied to different departments and organizations or used as a roadmap for online data analysis. Let’s start with a simple definition. Exclusive Bonus Content: Get Started With Scores And Business KPIs! Download right here our bite-sized guide and start creating your reports! What Is A KPI Scorecard? A KPI scorecard is a term used to describe a statistical record that measures progress or achievement towards a set performance indicator. It gives decision-makers the ability to combine specific metrics in order to gain an overview of a complete performance scorecard. There are a number of business scenarios when they are useful, whether a specific KPI scorecard, performance scorecard template, or BI scorecard that utilizes a KPI software for generating valuable insights. Since there are 2 main (or umbrella) types, we will now explain the characteristics and benefits of each one. Time period: This kind, or a KPI scorecard, has a time period as a basic necessity. Time periods can show previous time periods or just an overview of a static one. Grading systems and totals: The performance level is based on a grading system, for example, of an employee that summarizes his or her scores to the overall objectives through an employee scorecard template we will discuss later. Comparisons: They can vary between people, departments, set goals or previous goals, or budgets. It expounds on the entirety of the company’s workings, not only the external sales and services, for example, but also the internal perspectives. Often it is called also a balanced scorecard dashboard since values can be presented on a dashboard. It includes top indicators per perspective (usually the most measurable KPIs). Objectives and goals are clearly written (i.e. cut spending or increase revenue) while targets are included as numeric future values to show the comparison between current status and target, or comparing with the previous values. It must also include current values within a set time frame. Enhanced strategic planning: If a BI scorecard is used, it can improve strategic communication between the cause and effect relationship. That means that building a strategy and identifying outcomes can be clearly correlated by structuring a complete business picture. Improved management decisions: By using a KPI scorecard template, a company is forced to create scorecard metrics for their strategic goals. This will ultimately ensure that managers measure what actually matters and thus increase the quality of information needed to make better KPI reports and data-driven decisions. Advanced performance reporting: A structured approach by using performance scorecard examples that we will explain later, enables companies to enhance the KPI management processes that bring transparency of information internally and externally by creating meaningful management reports. These are just some main characteristics and benefits that brings value to the company’s performance and decision-making processes. Often times, scorecards and dashboards are used as synonyms, especially a balanced scorecard dashboard, but we have to differentiate the two since they do have some similarities and can be connected, but they are 2 different sets of data analysis and performance tracking. Let’s take a look at that in more detail. Many people talk about ‘dashboard scorecard,’ but does this expression even make sense? There are numerous differences between scorecard and dashboard, and now we will concentrate on the most prominent ones to get a distinct picture of the two. Purpose and updates: The purpose of an online dashboard is to monitor performance while a scorecard is concentrated on managing the performance. Professional dashboards have integrated intelligent alarms that monitor data on a real-time basis while scorecards do that periodically (daily, weekly/monthly/quarterly). Let’s say you’re sitting on a meeting, presenting data to relevant stakeholders. A dashboard will immediately set an alarm (during the meeting) if a specific business anomaly occurred. A scorecard will tell you the same information, but one week later. On the other hand, on a KPI scorecard template, you could see how much values you miss until you reach the set targets and, therefore, you can decide on which steps you need to take. Decision nature and influences: A live dashboard is used daily in companies as they provide and offer an easy to access operational view of success while scorecards focus on companies policies. Data in dashboards are used to provide more efficient day-to-day management of teams, expenses, and resources while scorecards always compare the performance to the set target values. While there are numerous types of dashboards which can also be used for different business needs and interconnect with scorecards, it might make sense to use both to get the most out of the business information and overall picture. Measures and parameters: Scorecards are most commonly focused to track KPIs in comparison to a set target. However, since their data is not updated on a real-time basis, they can only look into this information periodically, as mentioned earlier. That means that scorecards will often aim to the overall progress (towards meeting targets or measuring the efficiency of a particular department) and strategic goals relative to KPIs, thus enabling managers to make informed decisions on a larger scale. We have established the definition, general characteristics, benefits and the difference between scorecard and dashboard. Now we will discuss and focus on business scenarios they can and will improve, if used correctly, and how. Our first example below is a balanced scorecard that could be used for a large or a mid-sized company. We have made an overview of the financial goals, learning and growth, customer and internal objectives. 1. Balanced scorecard – how is my company performing? Let’s see what this example is telling us by starting with the time frame and financial objectives. We have set the target date as December 2018, and we can see on the top of the example above that the current time frame combines the first 11 months of the year. On the scorecard, we can see how, and if, our goals are being met (or not). In the financial objective, we have set our yearly targets to increase the total revenue, the net profit, profit margin, and profit per customer. The first column shows that our target was set on € 5.458, and our current target shows we have reached € 6.197. The final column shows that we have achieved the target, and even exceeded for 13.5%. Mission accomplished. Now let’s take a look at our goal to increase the profit margin. We can see that we have one month left to reach the set target of 25.5%, but we are on the margin of 23%. It is unlikely that we will be able to do so in just a month (we miss almost 10% to achieve it), so our line color at the right side of the scorecard shows the corresponded likelihood (you can also see the full legend at the bottom of the scorecard). Overall, we can say our financial objectives are performing well, with setbacks in the profit margin that we can use for next year’s planning and business adjustments. Let’s go to the customer objectives: increasing the number of active customers and signups, sustain customer retention and improve the overall satisfaction. We see that these targets are not likely or very likely to achieve. It would be possible to increase the number of active customers by launching a marketing campaign that will focus on this goal, but we see that other targets are unlikely or even very unlikely to reach. We can notice that we even lost customers and our goal was to sustain the retention. We fall short of 14.6% and to reach this target within a month, it would be extremely hard, not to say impossible. Our customer satisfaction also dropped by 14% and to improve it in such a short time frame, we can comfortably say it will not happen, and the red line on the right clearly sums it up. The same analysis we can apply to the learning and growth, and internal objectives. Some of the targets are very likely to achieve, some unlikely. This can help in our strategic planning for the next year, and to see what kind of setbacks we had and how to improve them. If we dig deeper into the daily operations and performance, we might be able to define specific causes that have affected these results. That being said, our next example will focus on the specific performance of an agent working in customer service. One of our performance scorecard examples provides a general overview of an individual or departmental overall performance. Let’s see this through a visual example. Meet Sophie. She works in customer service in Texas, and her overall performance is superb. She has 18 points above target and she is the second-best customer service agent in the year 2018. Let’s explore what she can teach her colleagues and where she could improve herself even more through an employee scorecard example. The manager of the department has set the weighting of her grading system based on percentages that are important to the overall positive performance of the department. Her specific performance is divided on the gradings set by averages, customer focus and the weekly call cycle (also the average number). These main gradings are distributed even more into detailed aspects during a set time frame, in this case, the year 2018. Her target numbers are followed by her actual, so she and her manager can clearly see the exact difference in performance. The next column shows how much she is off target (also exceeded), and the overall score. If her manager would go into details, s/he can suggest how to adjust her response time and calls per hour to increase efficiency. We can see that her customer retention is 20 points above target which means she could talk to other colleagues who don’t perform that well and share her tips and tricks. Her solved issues are also on a high level of performance which is extremely important in a customer service role. Her manager can easily conclude that Sophie is a top performer, and this employee scorecard template shows exactly in which aspects. 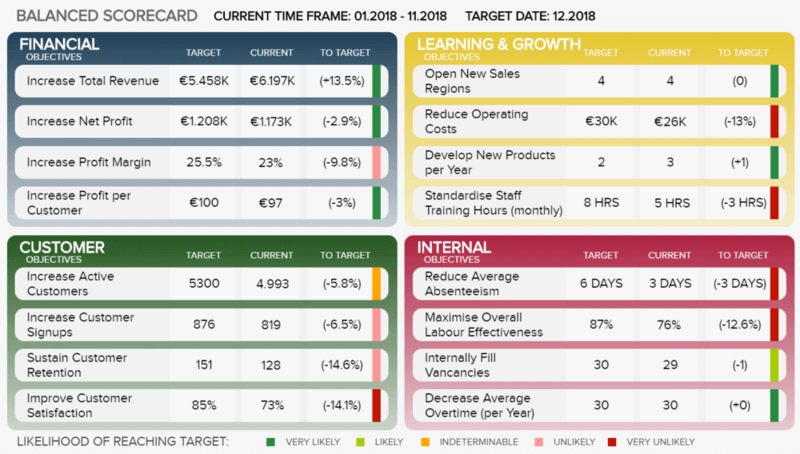 This employee scorecard example can be also used during and throughout a project or at the end of the project looking back. It is a compact view for project managers, department leaders and top executives to see how efficiently, successfully, and within expectations, the project or employee performance is progressing. Let’s go quickly to our final performance scorecard template and see what kind of scorecard we can create that can be included in a comprehensive social media report. This is one of the KPI scorecard examples that is focused on marketing activities performed on social media. We can see an overview of 4 different social media channels: Facebook, Twitter, Instagram, and YouTube. Let’s see how do we perform against our set targets. On Facebook, we have defined that our followers’ target number is 2500. We can clearly see that the actual number is 2400, and that we miss 4% to reach our goal. If we compare it to the previous period, we can definitely conclude that we have increased the number of total followers by 2.3%. The same we can apply to the number of impressions, link clicks, and engagement. The graph below shows us the trend of our CTR during a 6-month period. 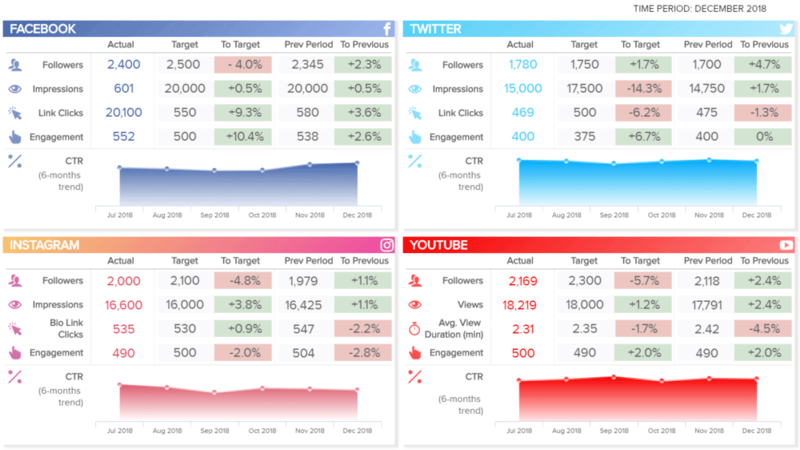 If we see that all of our other scorecard metrics have achieved our set targets, we can create a campaign that will focus only on increasing the number of followers and therefore complete all of our Facebook objectives. Similar social media KPIs can be found in other platforms as well, enabling us to adjust our campaigns accordingly. Scorecard reporting includes all the information we have discussed in our examples and information about objectives, measures, and projects. It can also include follow-up tasks from the last meeting, and is usually reported on the next team leadership meeting. How much into detail a manager should go, it depends on the overall objectives and selected scorecard type. 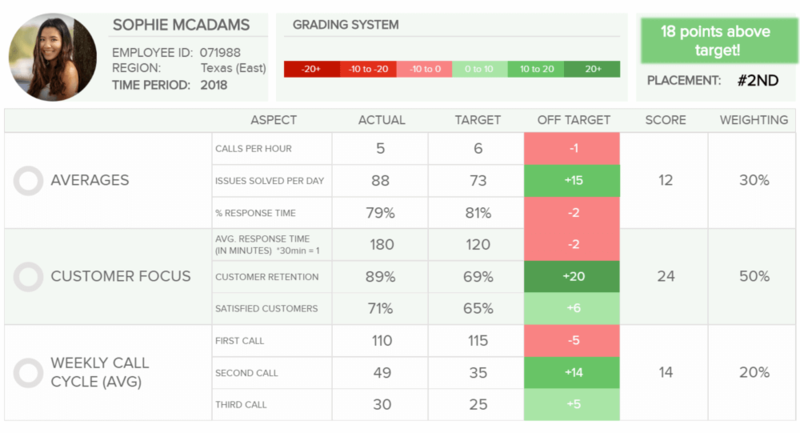 Scorecard reporting is a great way to present a complete overview of the scorecard status and any additional information a c-level executive might want to share. 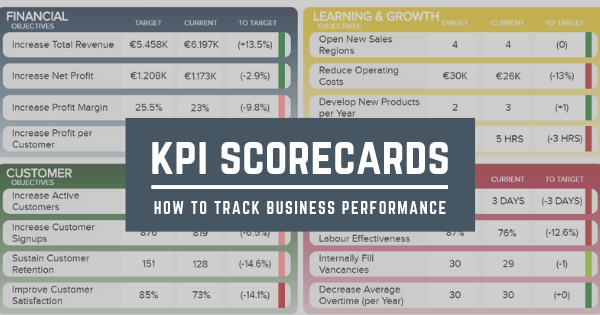 We have explained what is a KPI scorecard, provided real business scenarios that can be used in enterprises, mid-sized and even small businesses. Now it’s your turn to get in action and create your own scorecard with our software which you can try for a 14-day trial, completely free!